I once made the girl who lived next door to me drink mud. The fact that I was only 4 or 5, and this was a pretend tea-party where we’d mixed up earth and water to resemble hot chocolate in the blue plastic teacups, could perhaps excuse my behaviour, but the memory is harsher than that. 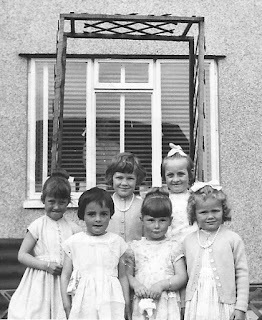 There were three of us at the tea-party: me, Anne, my next door neighbour, and Kathryn, who was my best friend at the time, and that intimacy between us created a streak of cruelty towards the ‘outsider’. ‘You have to drink it if you want to play with us. ’ I remember us pressurising Anne. And she did. Or at least I remember watching the mud seep between her closed lips. And I think she might have cried. Cruelty might be too strong a word here; bullying might be more appropriate although that doesn’t make the memory any less unpleasant. Some people might interpret the whole event as part of any child’s introduction to social dynamics, the emotional experiences of inclusion and exclusion. Others might say that what adults perceive as cruelty in very young children is often only curiosity: a desire to know the result of a particular action. And perhaps I’m making too much of it, searching too deeply for a meaning that might not be there. But why have I remembered it so vividly? I hope it was an early lesson in self-reflection and it affected how I treated people from that time on. Cruelty is on my mind. My sister-in-law’s baby died yesterday. Florian was due to be born by C-section on Thursday 13th October but his heart stopped in the womb. We try to make sense of this with words: his heart was too tender for this world. We try to nurse grief: he fell asleep in the safest of rooms. But there is no sense to a death like this: it is cruel and I want to kick death in the teeth. I know love will restore my brother and his wife in time. The love they have for each other and their two beautiful children. And the love and kindness from their family and friends in Wales and France that are already wrapping around them. I wish I could be closer right now. We are lucky if we have kindness in our lives: lucky to be in a position to offer it and lucky if we can let ourselves receive it and not beat it away with ‘wordsticks’ – there was really no need… oh, you shouldn’t have done that. It takes humility to accept kindness. Thank you for what you have done for me. Living here in the south of France has meant that we’ve been able to have lots of family and friends to stay, to make a fuss of them and share the loveliness of this place for more than three years. And when we’ve been back in the UK people have made a fuss of us too, and in Kent no-one has done this more than our friends, Bernie and Chris, whose home becomes our second home for lovingly prepared favourite foods and music dvds, for long talks and feet up on the sofa and wondering how 8 or 10 hours can melt around us so quickly. Tony came in while I was writing this and said, ‘You haven't eaten. Can I make you beans on toast?’ Yes, please. And then, ‘Try and think about the two gorgeous kids they have.’ Yes. Think about that. And the kindness of people. And sunrises. Write about ordering someone to do something. Write about watching children play. Write about a place where you feel at home. Write about a sunset or a sunrise. Thanks for sharing that, Lynne. Very touching. The first paragraph of section 3 is particularly appreciated. Perhaps I should have been your childhood friend - as I loved the taste of mud, and was often found licking it from stones! Thanks for reminding me. Best wishes to you at a tough time - here's to building words nests with those word sticks - and feathering them with friendship and settling down to rest in them. So so sad. I don't know how people recover from losses that cruel. But they do, of course they do. All my love goes out to you and your family.